I find myself rushed this week, Dear Readers, so this post will not be as long as it ought to be given its subject: Wendell Berry. Mr. Berry is a noted essayist, novelist, poet, and environmentalist; he is particularly concerned with the loss of small farms in America. He practices what he preaches, living and working on his own farm in Kentucky. Entries is the first book of his that I’ve ever picked up; I wish I’d come across it sooner, because the poems in it are wonderful. They are human and humble, agile and grounded. Though I admired all the poems, and the poet’s fine sense of our relationship to nature, I particularly loved a poem called “The Wild Rose,” which is a tribute to his wife, and In Extremis, a series of poems about his father’s illness and death. If you’d like to get a sense of Mr. Berry’s style, the Poetry Foundation has links to quite a few poems on this page. 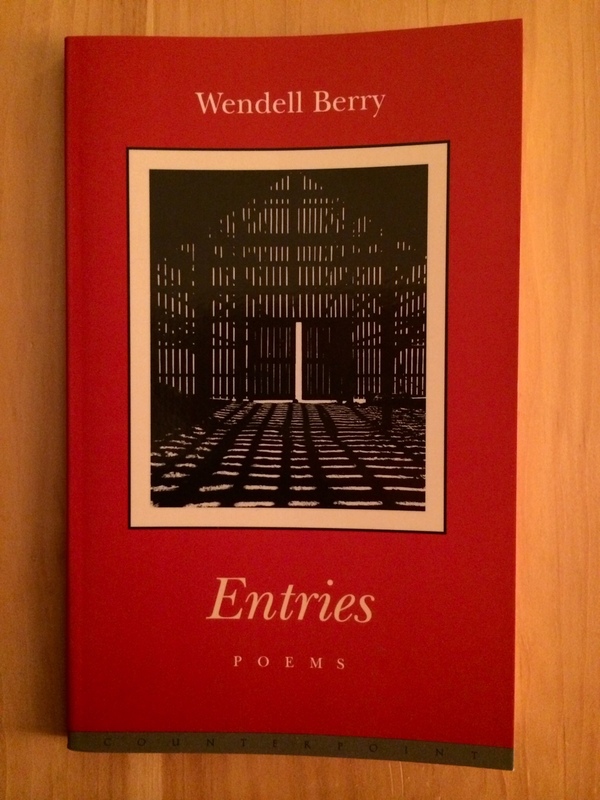 I highly recommend Entries; I’ll be on the lookout for more books by Wendell Berry. If you have a favorite book or poem, please let me know what it is! Shire Squire has a soft spot for “The Owl and the Pussycat” and Eugene Field’s “Seein’ Things;” the former for its playfulness and the latter for its distillation of the inner life of boys in their formative years. Both also lend themselves to recitation to and by children. Shire Squire is wary of poems that do not rhyme; Wordsworth really needed to rethink what he was doing with a lot of his poetry. I don’t have time to look at very many, but I read September 2, and it is beautiful. I like the images of the sunflower and the birds tossing themselves up like rags.